Posted on September 16, 2016 by Katharine L.
Harry Potter is an eleven year old boy, but not an ordinary one. Certainly not ordinary. He is a wizard. But he never knew this for eleven whole years. Harry Potter is a boy who learns on his eleventh birthday that he is the orphaned son of two powerful wizards and possesses unique magical powers of his own through hundreds of mysterious letters. He is summoned from his life as an unwanted child to become a student at Hogwarts, an English boarding school for wizards. There, he meets several friends, Ron and Hermione, who become his closest allies and help him discover the truth about his parents’ mysterious deaths: That they were killed by the Darkest wizard of all time, Voldemort. Voldemort was such a powerful Dark wizard, that many feared to speak his name. He was know by common witches and wizards by “You-Know-Who.” Voldemort was part of Harry’s mysterious past, of why he was left on the doorstep of his mother’s sister’s house, eleven years ago. Harry’s mother and father, James and Lily Potter, were both of magical blood. Voldemort tried to kill Harry and his family one night at Godric’s Hollow, but failed to do so. Harry’s parents died tragically trying to save him, but Harry Potter lived on with only a lightning scar on his forehead to resemble his horrible past connected to Voldemort. So this was why Harry Potter was brought to where his aunt, the Dursleys, lived, at the age of one year old. And he lived there for eleven years, not know he was famous, not knowing that Voldemort had tried to destroy him, not knowing he had broken the powers of one of the most powerful Dark wizards of all time. The young wizard lived with the Dursleys, where he was treated like a slave. But one day Hogwarts wrote to him, and off he went to the magical school, where he and his scar were famous. At the magical school, Harry meets Ron, a good-natured, red-haired wizard, and Hermione, a bossy know-it-all witch at Hogwarts. Overtime, they become good friends. Harry found Hogwarts very exciting, what with all of his classes, perhaps except for Professor Snape’s class, which was Potions. He has never flown on a broomstick, played Quidditch, the popular sport in the magical world, or worn a cloak of Invisibility. But not that his whole year at Hogwarts was fun. At the end of term, who other does he come face-to-face than Voldemort, his arch-nemesis. Harry barely manages to escape, but in the end he does, by using his wit and courage. And there goes the story of a brave wizard, where he is remembered as the true hero at Hogwarts. However, he has to spend his summer with the Dursleys, which he is definitely not looking forward to. Oh, well. He can’t wait for his second year at Hogwarts, where he knows there will be more adventures to come. I really liked this book, because it was really unique. Harry Potter’s adventures, Quidditch, everything, was so original. My favorite part of this book was when Harry, Ron, and Hermione went through a secret trapdoor to defeat Voldemort once and for all. I would recommend this book to anyone who loves thrillers and adventure! I know I certainly enjoyed the book! 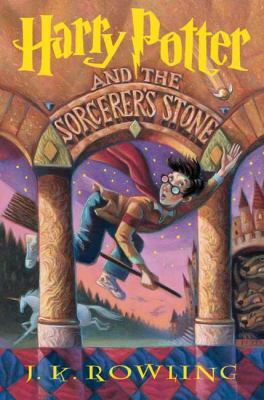 Harry Potter and the Sorceror’s Stone is available to checkout in multiple formats from the Mission Viejo Library and online through Overdrive. This entry was posted in Book Reviews and tagged book series, england, Fiction, magic, school life, witches, wizards by Katharine L.. Bookmark the permalink. THIS BOOK (and the whole series in general) IS THE REASON WHY I STARTED TO LOVE READING! Such an amazing review too!